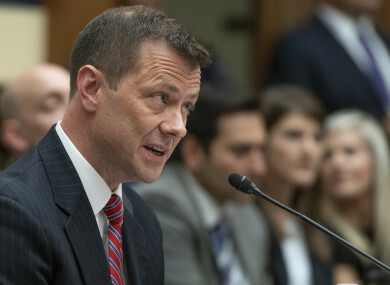 FBI SPECIAL AGENT Peter Strzok, who was removed from the probe into Russian interference in the 2016 presidential election after it was revealed he had exchanged anti-Trump text messages with his lover, has been fired, his lawyer said today. President Donald Trump immediately welcomed Strzok’s firing and used the occasion to lash out once again at the investigation by Special Counsel Robert Mueller into whether there was any collusion between Russia and the Trump election campaign. “Agent Peter Strzok was just fired from the FBI — finally,” Trump tweeted. “Based on the fact that Strzok was in charge of the Witch Hunt, will it be dropped?” he asked in a reference to the probe by Mueller, a former FBI director. “It is a total Hoax. No Collusion, No Obstruction — I just fight back!” Trump said. In addition to the Mueller probe, Strzok was also involved in the investigation of Hillary Clinton’s use of a private email server while serving as secretary of state. Goelman, Strzok’s lawyer, said he was fired by FBI deputy director David Bowdich on Friday despite the fact that the agency’s disciplinary office had decided he should face a demotion and a 60-day suspension. “This decision should be deeply troubling to all Americans,” he said in a statement. “A lengthy investigation and multiple rounds of congressional testimony failed to produce a shred of evidence that Special Agent Strzok’s personal views ever affected his work,” Goelman said. “It is a decision that produces only one winner — those who seek to harm our country and weaken our democracy,” he said. Strzok and his lover, former FBI lawyer Lisa Page, exchanged text messages during the 2016 election campaign which were highly critical of Trump, the then-Republican nominee. Email “FBI agent who sent anti-Trump texts to his lover fired”. Feedback on “FBI agent who sent anti-Trump texts to his lover fired”.